Powerboat racing is one of the most exciting watersporting activities in the world today and with more and more affordable routes into this fast and furious sport there has never been a better time to get in on the action. 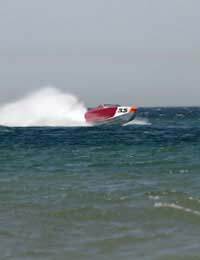 There are two main types of powerboat racing – circuit and offshore. Essentially circuit racing takes places on closed and protected inland lakes and rivers whilst offshore racing takes place on coastal waters. Within these disciplines there are race classes for craft within a variety of specific guidelines – such as the litre engine classes and the RIB classes - and there is one-design racing where only one specific type of vessel is allowed to compete. Zapcat Racing is an example of a strict one design powerboat racing. Zapcats are catamarans that have been fitted with 50 hp engines allowing them to cut through the water at speeds of up to 50 mph. Zapcat racing is not only one of the easiest motorised watersports to get into but also one of the cheapest. For around £10,000 Zapcat racers can be ready and waiting at the starting line in their new craft, along with the necessary licenses and safety equipment. The Hotboat Race Series has been created to allow the greatest number of vessel types to compete so as to create an exciting and exotic race field true to the original spirit of powerboat racing. The broad guidelines just specify that entrant boats must fit within either the 600 or 1000 horsepower class of vessels. The Royal Yachting Association (RYA) have devised two levels of courses aimed at giving people essential grounding in powerboating skills and techniques before they are able to hit the high speeds. These are taught at boating clubs and centres across the UK. The first level covers such subjects as boat handling, safety and rules and ropes and knots, whilst the second moves up a few knots by including high speed handling as well as navigation, launch and recovery. For the more experienced powerboaters, certain training centres offer more specialised racing courses to refine their skills on the circuits. The Neil Holmes Power Boat Training Centre in Southampton, for example, offers a specialist race training course for high performance boat racers and includes such themes as tactical driving, understanding your race boat and cornering techniques. Beginner racers should begin with basic or club racing, where they can acquire the skills to take them onto national and international racing. They should then contact a local racing club and enquire as to when the next club event is. The clubs form the heart of the sport as they take the responsibility of obtaining licences for member, organising the races and having the boats assessed. Racing clubs are welcoming of potential new members and many offer ‘Have a Go’ events where anyone can experience the thrills of the sport in a training boat. Before entering it is important to check whether the craft and occupants meet the basic safety and technical requirements for club racing as listed in the Offshore and Circuit Racing handbooks PB1 and PB2. These aspects will be carefully scrutinised by RYA officials before being allowed to race. Eager competitors should then complete the entry procedure and then turn up with their vessel on race day. For basic and club racing entrants will be required to pay the club a race entry fee and purchase an RYA event licence. The entry fees vary between disciplines but typically cost between £50 and £80. The event licence is obtained through the club hosting the race event and will cost £40 for a circuit event and £60 for an offshore event. The licence is valid for the duration of the event and so will be eligible for any of the races being hosted, which in some cases might run over a full weekend. Before obtaining a racing licence applicants will need to have a medical and take a short exam covering safety and racing rules. The club will then submit the application and fee cheque to the RYA, whereupon a provisional licence will be offered up until the holder can prove their responsibility helming a craft. Whether on inland lakes and rivers or the wild rolling waves of open coastal waters, the exhilarating action of powerboat racing provides speed freaks with a major adrenalin rush that is hard to beat.